Fishing is one of life’s great joys. Nothing beats the anticipation of casting a line into the water in hopes of getting a big strike. So you wait and wait and reel in and cast again and again and again. Unfortunately, that strike you’re craving may not occur anytime soon for any number of reasons. Perhaps the fish aren’t hungry or you’re using the wrong bait. Also, it might just be that the fish aren’t there. How are you to know right? Well, there is a way to know as it turns out. All you need is a fishfinder. In general terms, this advanced piece of equipment takes a lot of the guesswork out of fishing by directing your efforts towards locations where there actually is something to catch. It makes use of sonar to generate a graphic image of the bottom of a body of water as well as schools of fish in the vicinity. When it comes to a range of fishfinders, Humminbird arguably comes second only to Garmin, consistently delivering high quality and innovative fishfinders at affordable rates available to the masses. Though there are quite a number of fishfinders out in the market, one of the leading brands is from Humminbird. The company has been making fishfinders and other fishing-related electronic gear for more than 40 years. They are considered as pioneers in the field and their products enjoy great respect from both sport and commercial anglers. Humminbird has quite an impressive line of fishfinders and all of them come with pretty remarkable features. So as always, it’s best to read up on the options available and consider exactly what you need. But then again, you could also just shoot from the hip and buy on the spot. Be prepared to stay a while though because you just might end up with more gear than you planned to get. 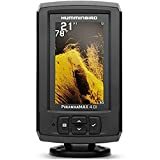 The Humminbird PiranhaMax 230 PT Portable Fishfinder is the perfect fish finder for the recreational fishing enthusiast and is easy to use, attaching effortlessly to small boats, kayaks and dingy. It is a step up from the factory installed fish finders and works to a depth of 600 feet using dual sonar beams. The Humminbird PiranhaMax 230 PT Portable Fishfinder also has a wireless function with a maximum depth of 120 feet. It has a high definition 4 inch, 4 levels grayscale LCD display, which is visible in bright sunlight and at night time. The Humminbird PiranhaMax 230 Portable Fish Finder is truly the most versatile, portable fish finder on the Market. The 230 PT functions as a traditional fish finder, using the suction cup transducer. It additionally can be used with the SmartCast wireless system, to locate fish under docks or anywhere you can cast the SmartCast advanced remote Sensor (RSS). Nearly all the reviews for the Humminbird PiranhaMax 230 were 5-star reviews and the customers appear to be more than satisfied with its performance. One customer, Gameface from Salt Lake City, uses the unit for trout and Konkani salmon on recreational fishing trips. Another reviewer Kenneth Roice has used his unit in diverse weather conditions including snow and found it to work excellently and he recommends it to others. The PiranhaMax 230 uses resident memory to record your settings so that next time you use it you will not have to reset. The suction cap transducer is suitable for aluminum, wood and fiberglass hulls and there is a built-in cable wrap for the transducer. Fish show up on the display as large solid symbols if they are below the boat in deeper water and as hollow symbols if they are around the boat. Target depth is also clearly indicated and the bottom is also distinguishable from the target depth. A three-level backlight display is ideal for night fishing. The Humminbird PiranhaMAX 160 PT Waterproof Fishfinder has many advanced features including Fish ID+, fish alarms, depth alarms, zoom, and more. It has a one-touch operation and is very easy to use. The 4-inch grayscale monochrome display shows a clear readout in both sunlight and at night time. Both the fish and the bottom of the ocean or lake bed are easily visible at all times. Using sonar technology the Humminbird PiranhaMAX 160 PT Waterproof Fishfinder sends sound waves from a transducer down into the water. The echoes returned are plotted on the display showing an accurate picture of any underwater activity as well as clearly showing the bottom. The Humminbird PiranhaMAX 160 PT Waterproof Fishfinder is every fisherman’s friend and can be taken on all short fishing trips without recharging. It has long battery life and will lead you the fish accurately and easily. Using dual beam sonar with a wide degree of coverage, it is ideal for ocean fishing, lake fishing, and some deep river fishing. The dual beam technology is ideal for a variety of different water conditions and depths in both fresh water and salt water. Customer reviews of the PiranhaMax 160 indicate that the purchasers of this unit were very happy. B. McCready from the Eastern United States uses the PiranhaMax 160 on his kayak and comments that the suction cap is great and there is no worry about it falling off and losing the transducer in the water. Another reviewer TroutTroller compares the PiranhaMax 160 with two other portable fish finders that he also uses, saying that the PiranhaMax works the best out of the 3 units. The package includes fish finder unit, charger, carry case and suction mount transducer and it ships to anywhere in the United States and Canada. 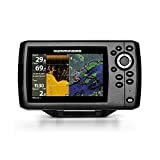 The Humminbird 110 Fishing Buddy Waterproof Fishfinder is perfect for all recreational fishermen and it is portable enough to take in your bag and use in your friend’s boat, a hire boat or your own boat if you have one. It has an ergonomic clamp for mounting almost anywhere and it uses no rigging or wiring. The monochrome display has a high resolution, which reads easily in sunlight and the 24-inch transducer reaches the water easily from most small boats. The Humminbird 110 Fishing Buddy Waterproof Fishfinder is a great companion for any hobby fisherman and it can easily locate fish below the surface and guide you to the best fishing spots in the area. Most of the customer reviews for the product are favorable and are 4 and 5-star reviews. One customer, DefDC claims to have caught fish on both occasions that he has tried the Humminbird since he bought it. He was worried that the low price could have resulted in a bad buy but was pleasantly surprised each time he used it and he is now so pleased that he invested in this unit. The unit has a 30-hour battery life which should be sufficient for any weekend fishing expedition and can be easily recharged at a power source. The Humminbird RF25 SmartCast Rod Mount Fishfinder is a device that takes your traditional fishing to a new high tech level. The SmartCast RF25 1.25-inch display provides 48×32 lines of resolution in a true STN grayscale. The display offers visibly better images of the bottom and features a pulse backlit display for night fishing. It’s easy, one-touch menu provides easy navigation for the Fish ID+, fish alarm, depth range, and sensitivity. It is powered by a Lithium 2450CR watch battery which lasts up to 500 hrs. The Humminbird RF25 SmartCast Rod Mount Fishfinder utilizes a waterproof-dual channel RSS (remote sonar system) that provides an ultra-wide coverage of up to 12 feet deep and also a water surface temperature reading. Most of the customers who bought the Humminbird SmartCast RF25 in Amazon have posted positive feedback. 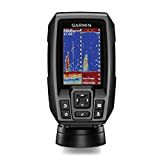 70 % of the customer reviews have given a 4 or 5-star rating for this fishfinder. Jessee Skeens from Orlando, Florida is generally happy with the SmartCast RF25. One of the admirable features of RF25, he pointed out, is the 1.25-inch display that shows the contour of the lake and, with the fish ID function, shows if there are fishes in the area. He noticed that there is a limitation of the unit near the shore as it gives a confusing reading in 3 feet deep water. But, as an overall assessment, he said SmartCast RF25 is a great device for learning to fish. Another purchaser, BassFisherMan, highly recommends the SmartCast RF25. He posted a positive review of the product and gave a five-star rating. He was determined to send his customer review to Amazon as he knew that reviews can sway a customer’s buying decision for a certain product. He had taken it out on three fishing trips so far, all in freshwater lakes. The unit mounts perfectly to the fishing rod. The Fish ID feature helped him a lot as he no longer moves around constantly in search of the best fishing spot. The display shows him the underwater ditches or deep holes. Negative reviews on this product in Amazon are mostly about quality control issues. Some customers who bought SmartCast RF25 had defective units which were promptly replaced. One customer said that he took his new RF25 out fishing and the display suddenly went black and stopped working. Changing the batteries didn’t help. Another customer also reported that his unit constantly provides a reading of 0 feet even in a 20+ deep water.